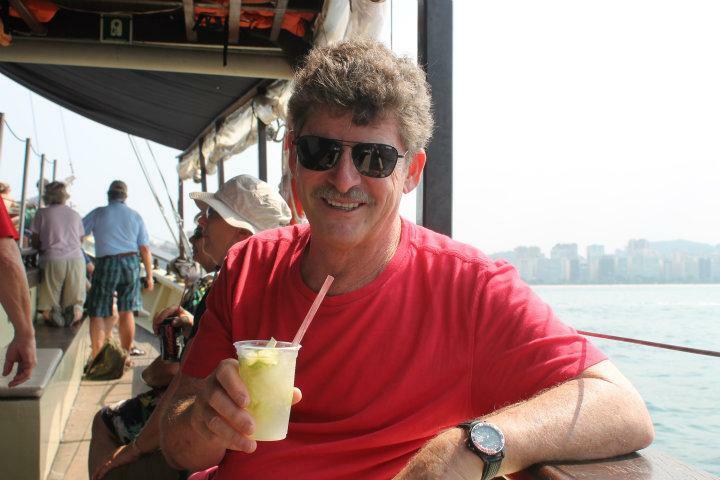 Cruise Around Guanabara Bay, Rio de Janerio – January 21, 2015 - Blog from Rio de Janeiro, Brazil | South America!! Stan and I do not usually sign up for sideline excursions when we travel. However, this one sounded like it might offer a different perspective on the area. We've seen Rio from ground level and from mountains like Corcovado and Sugarloaf. This trip gave us a chance to see the area from the bay. Plus it was said to occupy only about four hours of our day—we definitely do not sign-up for all-day trips!. We are glad we went. We met interesting people from Australia and spent two hours looping in front of the main part of the city, crossing over the bay to Sugarloaf, and sailing out past three ancient and abandoned Portuguese forts built as early as the 1500's. We crossed the narrow channel leading from the bay to the Atlantic and made our way to Rio's sister city across the bay, Niteroi. The sky was far too hazy for any knock-your-socks-off photos, but I'm hoping those we captured provide an idea of the scenery. I may have over done it with photos of the mountains and hills that surround the city and almost enclose the bay. My thought in including them in the photo album here was to try to give readers some sense of the many cone-shaped and humped mountains surrounding city that lend the appearance of islands. We had said goodbye to Renato on Monday but because we later asked him to arrange today's cruise for us, we met him after the trip to take care of payment. What a good friend he had become. He knew we were interested in seeing the Escadaria Selaron today and he also knew we were planning to take the subway to this area that is known to attract gangs, pick-pockets and other unsavories. He said he just did not like the area for visitors. We knew we would be ok by ourselves, but in the end, he escorted us to the famous steps via subway and then also took us on a walk to another part of the city where we got to sit and have iced-tea and cake at the famous restaurant, Colombo. Colombo is like a huge antique shop with walls lined with beautiful ceiling- high beautiful cabinets housing silver and crystal. It is famous for having been the favorite dining place of the presidents and important people since the 1700's. It was an absolutely lovely place to visit, we are very happy to have not missed it, and we thank Renato for that. This landmark in the Lapa area of Rio is a set of world famous steps created by Chilean artist Jorge Selaron over a period of about 23 years as a tribute to the Brazilian people. He began decorating the dilapidated steps in front of his home in 1990's. Of the 2000 or so tiles on the 250 steps, over 300 were hand-painted by Selaron himself. The others were tiles collected or donated from all over the world. It was a cool place. Google it and look at the picture there; then look at the photo in my photo album for today. I think you will see why Renato felt compelled to accompany us. We are off to different parts tomorrow. We will fly in to Puerto Iguazu to seen Iguzu Falls both from the Brazilian side and later from the Argentine side. Mary You guys are having too much fun!!!! We have had gorgeous weather here in Atlanta; Today was Greg's 60th birthday; we went to Tijuana Joes, sat out on the patio this afternoon in the warm sunshine and drank some margaritas with our early dinner. Then Greg blew out the candle on his Wright Gourmet Carrot cake (slice) at home. It was a wonderful afternoon. HOWEVER, winter is returning with more rain and possible sleet Friday--enjoy your hot sunshine--the food there looks fabulous!! I wanted that watermelon! !